"The service provided for my family by Multicultural Helping House Society has been a great help to us. The information given to me with regards to immigration procedures, as well as emotional, social and financial support have helped us a lot. The staff has always been professional and accessible. You can have full confidence, assuming that you provide all the documents requested of you, that your expectations will be met. In summation, we wholeheartedly recommend the non-profit organization, Multicultural Helping House Society, for all the help our family received. 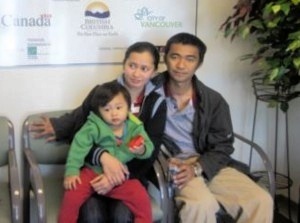 My husband, our 19-month old child and I arrived at the Vancouver Airport on 1st February 2011 as newly-landed immigrants. Unfortunately, while we had been eagerly waiting in the immigration queue, my husband suddenly collapsed and severely hit his head on the floor. He was unconscious. The airport paramedics arrived immediately and gave him primary treatment. He was soon transported to the Vancouver General Hospital for further medical investigation. At the hospital, some Filipino staff approached me and offered help as they knew we were strangers in this place. And within a few hours, the Vice President of the Multicultural Helping Society, Mr. Amado, and his wife arrived to comfort me. The next day, my husband had brain surgery, and afterwards was kept in the ICU for almost 2 weeks. During these days, the Multicultural Helping House Society helped me process all the official documents for immigration. They had accompanied me to the airport to get our passports. The immigration authority issued a one-year temporary resident permit instead of giving permanent residence, because we were not able to complete all the necessary assessments at the immigration desk at that time. However, I was very grateful. Tatay Tom – the President & CEO – and Tania Dina, the Settlement Counsellor of the Multicultural Helping Society were there comforting us. I was able to get a working permit for one year and apply for a SIN and an MSP. My husband was out of the ICU and had been transferred to the Neurosciences ICU. He later regained consciousness and could recognize people. But still, he had an endotracheal tube in his neck. The physiotherapist helped him walk on his feet with assistance. The first week of February, I went to the hospital accounts section and was shocked to see the bill, which contained a prodigious 6-digit figure. There was no way that we could afford to pay off that bill. For the first 4 months we had no source of income other than donations from the community. So we had to spend almost all the money that we brought from our home country. My husband was discharged from the Vancouver General Hospital and transferred to the GF Strong Rehabilitation Centre, where he stayed for one month. Our medical bill was growing higher and higher. At that point, the staff advised us to go home in order to keep the bill down. Right now, I’m glad that my husband is recovering quickly. The Multicultural Helping House Society staff provided me job search training, and eventually I got a job. They also helped me rent a house. After facing these challenges since our arrival on February 1 st 2011, we finally received approval from the CIC to become permanent residents. We are now in a much better place than the day my husband fell but we still a have a long way to go to live up to the expectations and dreams we carried here."